Not all families know that God intends for them to be together forever. The Church of Jesus Christ of Latter-day Saints (inadvertently called the Mormon Church) builds temples, so that sacred ordinances and covenants can be available to all of God’s children. The genealogy and family history efforts of The Church of Jesus Christ has always been about giving these eternal blessings to families. Behold, I will reveal unto you the Priesthood, by the hand of Elijah the prophet, before the coming of the great and dreadful day of the Lord. . . . And he shall plant in the hearts of the children the promises made to the fathers, and the hearts of the children shall turn to their fathers (Joseph Smith—History 1:38–39). The Genealogical Society of Utah was established in 1894 and since that time, The Church of Jesus Christ has gathered genealogical records worldwide to help members of the Church and others research their own family history. The Granite Mountain Records Vault in a Salt Lake City, Utah, mountainside contains more than two million microfilms full of billions of individual and family records. More are being added every day. Church volunteers are working to make these records available online. Members of The Church of Jesus Christ believe it is their responsibility to assist in the work of salvation for the human family. The primary focus of each member’s family history work is his or her own family. FamilySearch indexing is the opportunity to help other people find their ancestors. The historical records from governments and other record custodians all over the world used to be available to search on microfilm only at Family History Centers owned and operated by The Church of Jesus Christ. 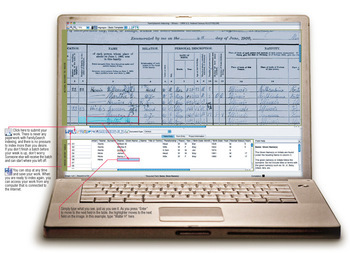 Now FamilySearch employees scan them into the indexing program. Volunteers view these records on their computers, type the information as they see it, and then save it in the database. The information is digitized and available to anyone worldwide through the search function on FamilySearch.org. The ultimate purpose of family history research is to unite families together forever. Members of the Church prepare their ancestors’ information so that Mormon temple ordinances may be performed for them vicariously. Mormons know that sacred ordinances and covenants available in holy temples make it possible for individuals to return to the presence of God and for families to be united eternally. Temple blessings are available to all who meet the worthiness requirements to enter the temple. This page was last edited on 3 October 2013, at 12:28.